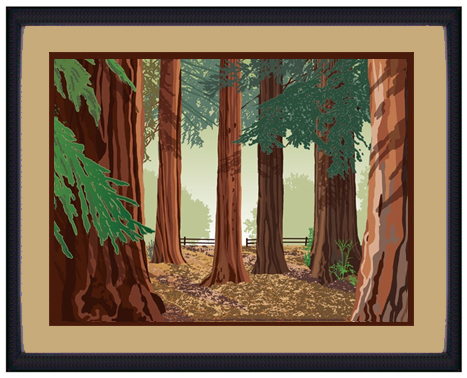 Bidwell Tree series "Redwood Grove"
Our "Basic" frame package for the Bidwell Tree Series Redwood Grove includes: acid-free foam core backing, double archival mats (neutral brown top mat, espresso bottom mat showing 2 3/4" overall viewable width, 1/4" reveal on bottom mat), standard plexi-glass, and a 1" wide, 'hammered' espresso and russet, gesso coated wood frame. 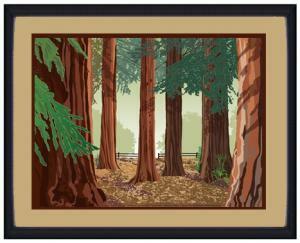 For other framing options, contact us. 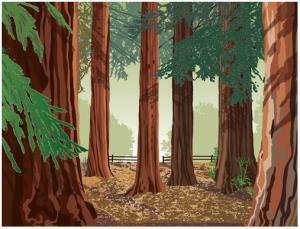 Hidden upstream from One Mile's Sycamore Pool is a fragrant grove of coast redwoods, which grow unexpectedly between North Park Drive and the creek. It is delightful to think they are mere children at 100 years or so and will continue to grow for centuries, witnessing weddings, family picnics and joyful weekends of multiple generations of Chicoans and visitors.